A perfect snack to serve at your next get-together, this jalapeño-flavoured cheese ball is sure to become your new go-to party favourite. 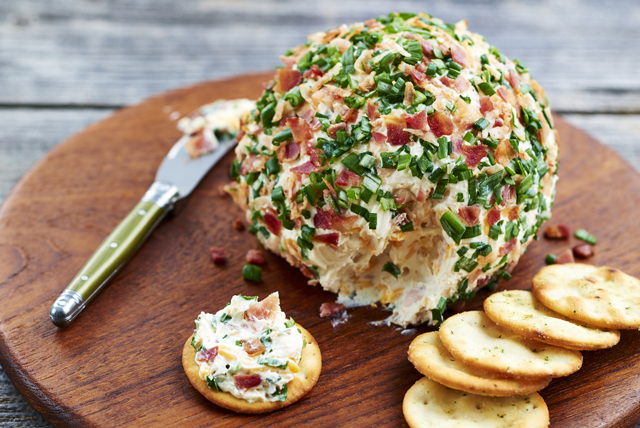 Coated with crumbled cooked bacon and sliced green onions, our Jalapeño-Bacon Party Cheese Ball is a guaranteed winner! Beat cream cheese product, cheddar and lime juice in medium bowl until blended. Add 1/3 of the bacon; mix well. Shape into ball; roll in combined onions and remaining bacon. Serve with your favourite crackers or cut-up fresh vegetables. Mix cream cheese mixture as directed; shape into log or 24 (1-inch) balls. Refrigerate as directed. Roll in combined onions and remaining bacon before serving.